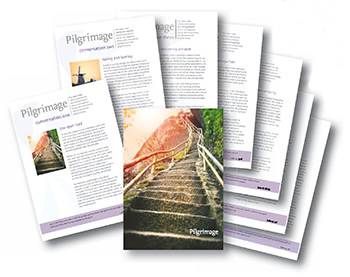 Designed and produced by Shoreline Conversations on behalf of CTBI, these booklets take up the theme of pilgrimage in a way that is resonant and accessible both to those familiar with pilgrim journeys and also those who simply wish to explore it as a metaphor for our spiritual journey through life. The conversation pack is available to view online although you may find it more convenient to purchase the printed version for use in groups. The hope, longing, purpose or invitation that motivates us to leave our normal environment or present perspective; seeking spiritual sustenance as we begin an intentional spiritual journey. The need to travel lightly and the process of becoming unencumbered. Making choices about what is essential and what is peripheral to the undertaking. Cultivating a certain availability and openness; allowing experiences and environments to speak to us; a quality of being, self-discipline and attentiveness to what is within and without. Our need for companionship on our journey to God, beginning to trust those who do not share our own perspectives; reflecting on the experience of many people on the move today, fleeing war and persecution in search of a better life. Between here and there; living with paradox and uncertainty; questioning the journey yet keeping faith; emerging dimensions prompted by unexpected events, people and places. Reaching our chosen destination; encountering the Sacred in silence and suffering; changing expectations and the invitation to change and renew. Returning home and its implications; what we are learning, how we are changed by the journey, things we are motivated to do that are different than before because of the experience.